LEGO is king in our house — I bet you also know a child that loves LEGOs. 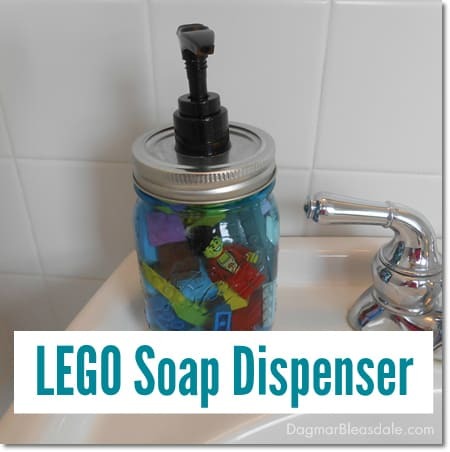 Well, then I have a great gift idea: a DIY LEGO soap dispenser. Added advantage — the kids will want to wash their hands all the time. Buy a see-through plastic soap dispenser and simply add LEGO pieces to it — that’s all! If you like the look of mason jars, here is a tutorial for a LEGO soap dispenser I made from a mason jar for Landon a couple of years ago. If the lid has writing on it, remove the ring and the lid top from the glass and separate the two pieces. 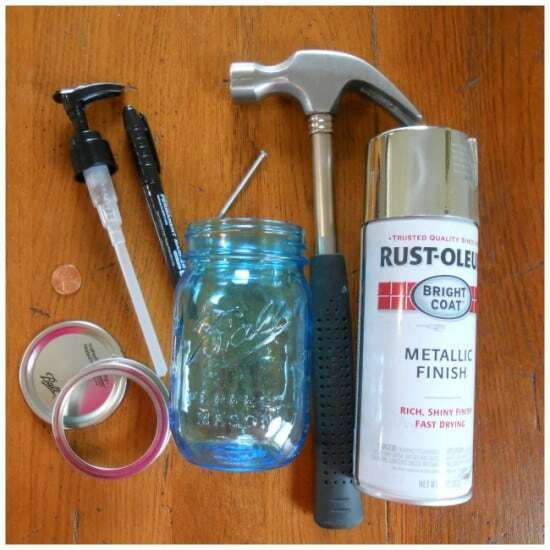 Spray paint only the top of the mason jar lid. I wouldn’t recommend brushing on paint. I guess you could also put a water-proof sticker on top of the lid. Spray paint one to two coats of paint on your lid. Be certain you allow for proper drying time before handling or you will end up with fingerprints or smudges. Look at the size of the base of your pump dispenser. Eye-ball the size or measuring the thickness of it with a ruler, then find something like a penny or the top of a marker that matches the same size. I used a marker top. 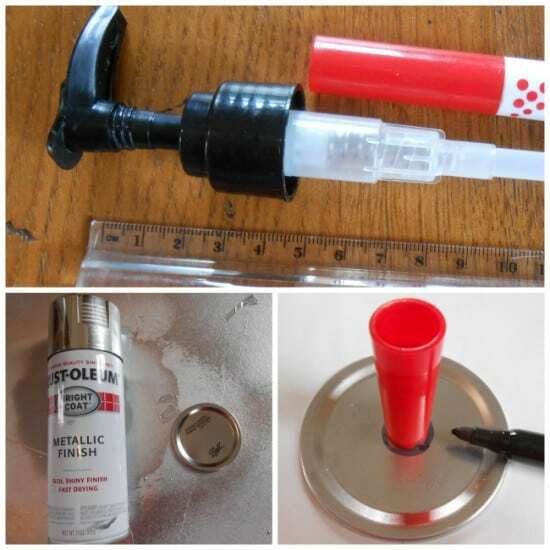 Trace around the item with your permanent marker to create a circle that will be cut out for the pump. Put the top of the lid back on the jar and secure it with the lid ring. Then use the nail and hammer to punch holes along the circle. Leave some space between the first round of holes so that you don’t have one side totally punched out – that will make making holes around the circle very hard. You want just enough of the circle intact that the middle of the lid doesn’t pop out until you are ready. When you can’t make more holes because the nail slips to the side into the holes you made, use your scissors to cut out the rest of the lid center. I used my flower scissors. If you don’t have heavy-duty scissors, you could also use pliers to remove the center. It’s better to make the hole a little too small than too big so you don’t have to start over. Ideally, you want the little sharp edges that result from the nail punctures to grab around the pump when you insert it into the hole in the top. 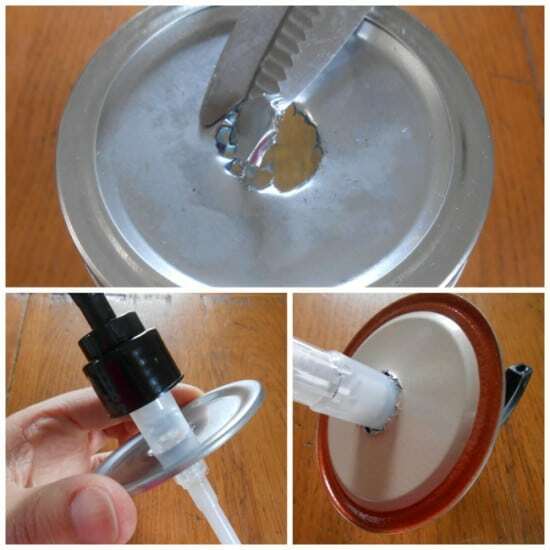 You could seal the pump to the jar lid top by adding hot glue to the underside of the lid where it meets the pump. 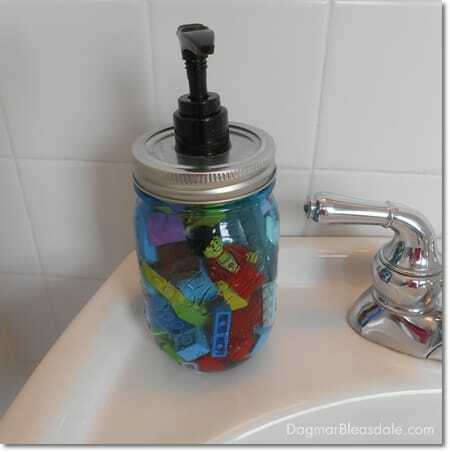 Add the liquid soap and LEGO pieces to the mason jar and screw the pump top to the jar. I had to cut my pump straw a little shorter to make it fit the height of my jar. You could also add other small toys to the soap dispenser, just make sure they are made out of plastic that doesn’t dissolve in the soap over time. This LEGO soap dispenser will be a hit with any kid! Happy Thanksgiving from the Blue Cottage! Who doesn’t love legos? This is such a cute idea for kids. I would love to see you share this at the Bowdabra.com Saturday showcase! What a great idea. I know some little ones on my list who will just love this… My only fear is that they will dump out the soap to get to the Legos… That would just be my luck though! lol ;-) Thank you for sharing on the Oh My Heartsie Girls Wordless Wednesday. Hi Michal, thanks for coming by! How fun! I’m actually going to make this for my dad. I think it goes well with the lego salt and paper shakers and lego Popsicle maker that he got for Father’s Day. He must be really into LEGO – how fun! Thanks or the comment and pin — I really appreciate it!